The 110x175mm Flat Card is designed for use as a top layer or insert for our 120x175mm Flat Cards, 120x175mm Scored Cards & our 120x175mm Pocket Folds. These have become increasingly popular as they fit in our 5x7 envelopes which in Australia posts for just the cost of a standard letter (subject to weight and thickness). New & Exclusive to the Australian Market, this premium quality metallic turquoise card stock is from the same manufacturers in Italy that make our fabulously popular Metallic Crystal Perle™ paper & card range! 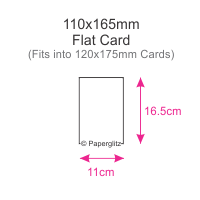 The card measures 11x16.5cm (close to 4.5x6.5 Inches). All of our 110x165mm cards fit perfectly onto out 120x175mm cards, which inturn fit into our standard 130x185mm / 5x7 Inch Envelopes or our 130x185mm / 5x7 Inch Invitation Boxes. Buy with confidence and specify only "Genuine Paperglitz 110x165mm Flat Invitation Cards" for your next project.